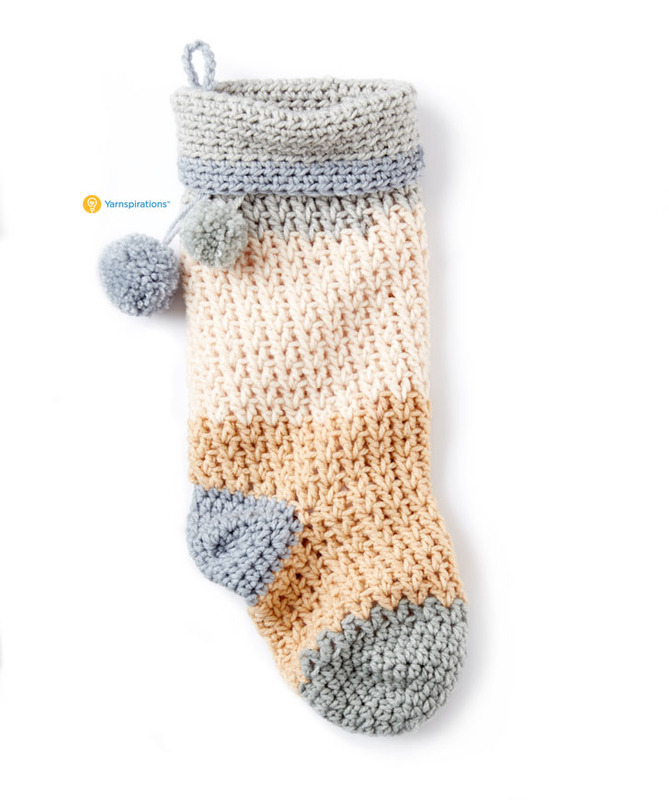 Crochet Stocking – for the entire family! Bernat Pop! yarn is one of my recent favorites. There are so many vibrant and gorgeous colorways, it’s affordable and soft. 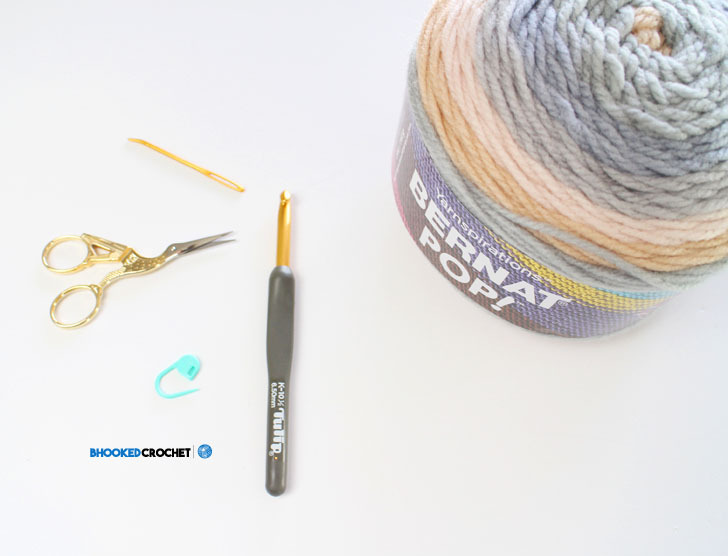 It was a natural go-to yarn when brainstorming for my latest crochet stocking pattern. I chose to work with “foggy notions” because it matches beautifully with my living room. I love neutrals and slightly less traditional holiday colors. 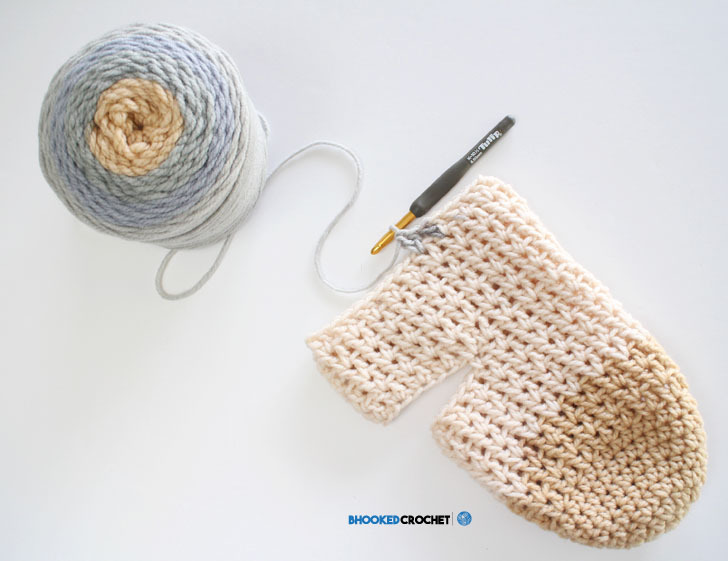 This crochet stocking may look difficult to crochet but it’s incredibly simple! My step-by-step video tutorial will walk you through the entire thing, from start to finish. By breaking it down into four sections, this pattern, although intricate to the eye, feels very doable. The best part? It only requires on ball of Bernat Pop! yarn and about five hours to crochet! Bernat Pop! yarn is available in 18 different shades that cover all the bases. Since each ball of yarn is unique, I can’t wait to see how your stockings turn out! Even if you have a dozen other projects on your hooks, this beauty is something you should consider. These stockings are great holiday gift ideas! I have recorded a step-by-step video tutorial to help you through this project. When you click on the link below, you’ll be directed to the video tutorial. If you haven’t done so already, have a look at the pattern and the video tutorial. Using the links above, you have access to all the information you need to decide if this is the right project for you. If you need any help whatsoever, please don’t hesitate to reach out! You can leave a comment below and I’ll answer any questions that may come up! THIs is a beautiful stocking! I downloaded it from yarnspirations, but I cannot seem to find how to do the heel. I may be blind but I just do not see the instructions for it.. help?? Round 1: Join yarn in middle v-stitch of chain with toe facing upward. Ch 2. Hdc next 11 chains. 1 Hdc in next 15 sts. Hdc in rem 7 ch. Join with slst to 2nd ch. Round 2: Ch 2. Hdc in next 8 sts. Hdc2tog. Hdc next st and place marker. Hdc2tog. Hdc in next 10 sts. Hdc2tog. Hdc next st and place marker. Hdc2tog. Hdc in last 5 sts. Join with a slst to 2nd ch. Round 3: Ch 2. *Hdc until two sts before marker. Hdc2tog. Hdc in marked st. Hdc2tog. Rep from * once more. Hdc to end of round. Join with a slst to 2nd ch. Rounds 4-5: Rep round 3. Fasten off. Assembly: Turn stocking inside out and seam heel using a whip stitch. Weave in your ends. Fold top down 3”. Make 15 ch, fasten off and secure just inside top of stocking to hang. Add a 35 mm and 45 mm pompom, securing with a knot just below the fold. Gorgeous Christmas Stocking. Thanks for the pattern and the video tutorial.